North Carolina, weighed 880 lbs. Omnivorous diet including acorns, berries, carrion, corn, fish, frogs, fruits, grasses, grubs, honey, insects, larvae, leaves, nuts, peanuts, reptiles, roots, seeds, small mammals, soybeans and wheat. Males are called boars and females are called sows. Bear reproduction depends on delayed implantation. While the egg is fertilized in the summer, it is not implanted in the womb until late fall or early winter. Cubs are born about eight weeks after implantation, weighing 400-600 grams at birth. Young are called cubs. Cubs usually stay with their mother through their first two winters. 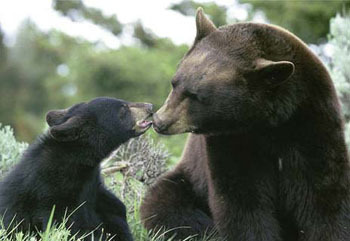 Once bears are yearlings (12-24 months old), they will disperse away from their mother from May through June. Average 4-5 years; few live longer than 10 years. Oldest wild bear in North Carolina was 26. Bears are abundant in the Mountain and Coastal regions of North Carolina, and increasingly common in the Piedmont. Bears live in an area (home range) of 5,000 to 50,000 acres, depending on their gender and the quality of the habitat. Ranges often overlap in high-quality habitats. Male bears sometimes fight each other during the summer breeding season, and young juvenile males are often forced to leave areas inhabited by large, dominant male bears. There are three species of bears in North America—the polar bear, the brown (grizzly) bear and the black bear. The black bear is the only species found in North Carolina or anywhere in the eastern United States and is an important part of North Carolina’s cultural, historical and natural heritage. Before Europeans came to the New World, black bears lived in all forested regions of North America and were abundant in North Carolina. However, black bears were often killed by early settlers to protect their families, crops and livestock. In time, bears across the state were also impacted by habitat loss from agricultural development and clear-cutting. By the mid-1900s, bears were only found in the most remote mountains and coastal swamps of our state. Then in the 1920s, the American chestnut blight (a tree-killing fungus) hit the Mountain Region, destroying the most important nut-producing tree for bears. As a result, bear populations suffered. However, thanks to science-based management and bear sanctuaries, black bears have made a remarkable recovery in population and range. Black bear expansion has occurred naturally as bears have moved into suitable habitats. As of 2012, there were approximately 17,000 bears in the state, occupying 61% of the state’s total land area. The black bear is an omnivore with a diet of both plants and animals. It varies in color: in North Carolina, the black bear is usually black with a brown muzzle and sometimes a white patch on its chest, commonly referred to as a chest blaze. In other areas of North America, black bears can be a very common brown color or a more rare blue and white. All bear species have five toes on each foot and each toe has a sharp curved claw enabling the bear to feed on insects and grubs in decaying logs. Black bears rely mostly on their sense of smell and hearing due to poor eyesight, but are adept at climbing, running, swimming and digging. They have been clocked at speeds of 35 miles per hour over short distances. Bears prefer large expanses of uninhabited woodland or swampland with dense cover. Lowland hardwoods, swamps and pocosins provide good habitat. Bears gain weight in autumn to prepare for winter denning, eating up to 20,000 calories per day (during spring and summer, they eat 3,000 to 8,000 calories daily). In North Carolina, bears enter their dens between late October and mid-January, and emerge in March or early April, depending on the weather and food availability. They use tree cavities, hollow logs, caves, rock outcroppings, slash piles, and thickets as dens. Within the den, they build a nest of leaves, sticks, and grasses, which often resembles a giant bird’s nest. Sometimes they build a nest directly on the ground. The black bear is a very shy, non-aggressive animal that avoids humans in most cases. Occasionally, bears wander into developed areas in search of food. 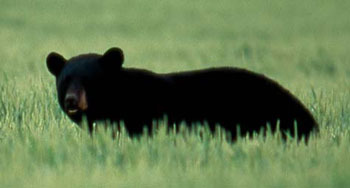 In agricultural areas where corn, peanuts, soybeans and wheat are common, bears often feed on these crops. Due to rising bear and human populations, bears and people are increasingly coming into contact with each other in many parts of the state. To avoid negative interactions, bears should never have access to human foods, garbage, pet food or bird food. Feeding bears rewards them for coming into residential areas. Bears feeding on unnatural food sources around your home may lose their fear of humans and will be more likely to approach people — a situation that rarely ends well for the bear and could have potential safety issues for humans as well! If you see a bear, stay calm and keep a safe distance. If you encounter a bear at close range, back away slowly and make lots of noise. Approximately 500,000 acres of land have been designated as bear sanctuaries by the North Carolina Wildlife Resources Commission. These areas permit bear populations to thrive. Bear populations are stable or increasing in most areas of North Carolina. Bear hunting is a tradition dating back to early Native Americans who depended on bears for meat, fat to season foods, and hides to make clothing. Early colonists in North Carolina quickly learned from the Indian tribes and developed a strong bear-hunting tradition that continues into the 21st century. Today, approximately 70 percent of hunters use hounds to pursue bears, including the Plott Hound—the official North Carolina state dog and famous bearhunting breed. The Plott Hound breed originated in the mountains of North Carolina around 1750 and is the only breed of dog known to have originated in this state. 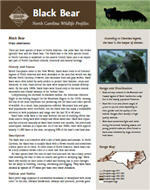 The comeback of the black bear is a North Carolina wildlife success story. In the mid-1900s, black bears were restricted to remote areas and reached very low numbers. Since the 1970s, over 500,000 acres of land have been designated as bear sanctuaries by the North Carolina Wildlife Resources Commission. These sanctuaries were key to the successful restoration of bears and are still vital to bear population management. Today, black bears are abundant and thriving in North Carolina. Regulated hunting is critically important in managing bear numbers. Bear hunting is a tradition dating back to early Native Americans who depended on bears for meat and hides. Early colonists in North Carolina quickly learned from the tribes and developed a strong bear-hunting tradition that continues today. Many hunters use hounds to pursue bears, including the Plott Hound, North Carolina’s official state dog. more about this IDVD, visit www.ncwildlife.org. Written by Mark D. Jones, Jane Krupnick, and Colleen Olfenbuttel, NCWRC; updated 2017. Illustrated by J.T. Newman. Bear and cub photo used with permission from National Geographic. Other photos by North Carolina Wildlife Resources Commission. BearWise. 2017. http://bearwise.org/ . Accessed 21 July 2017.
International Association for Bear Research and Management [IBA]. 2017. http://www.bearbiology.com/. Accessed 21 July 2017. I am a fortnite youtuber and this article helped me lots. Thanks mate! Intro says polar bears are one of 3 bear species in NC. I’m skeptical there are polar bears in NC. Thank you for visiting NCpedia and for taking the time to share your reaction to this article. The article indicates that polar bears are one of the three species of bear in North America. Otherwise, your skepticism would be correct! Black bears are the only species of bear in the state. thank you i am a fourth grader and i am doing a paper about black bears and this helped me a lot. thank you so much for creating this page! i am a 4th grader and i am creating a research article about black bears. you have been ever so helpful. thank you again! Thank you for the suggestion. We will add it to the list of topics we need to add. In the meantime, you may wish to check a library near you for some field guides to plants, trees, or flowers that may be found in the wild in North Carolina. Or field guides to animals found in North Carolina.